This beautiful siphonophore colony can reach a total length of 8-12 cm. The float, shaped like a series of bells on top of each other, constitute a significant fraction of the total colony length. In the bottom of the float there is a gas-emitting pore used to control the buoyancy of the colony. The banana-shaped, orange or violet colored tentacles may cause painful stings. At the base of the float, there are long threads packed with small animals with specialized tasks in the colony. 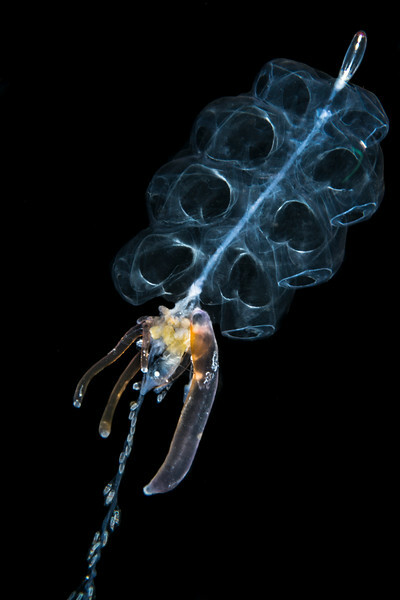 This siphonophore, sometimes called the hula skirt siphonophore, is known as a deep-sea species, but like all other slow-swimmers, currents may bring it to the surface.